Time Value Of Money. The basis for all business calculators. TVM allowed the user to deal with situations involving time (number of payments - n), an interest rate (i), a payment (pmt), a present value (pv) and a future value (fv). Given three of these including at least one of n and/or i, the calculator could solve for the others. Past or future dates (date +/- # days). 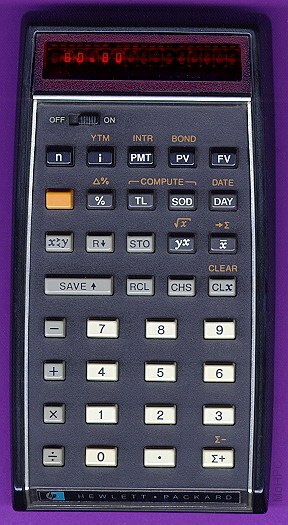 The HP-80 used the same basic technology as the HP-35. The major difference is that the HP-80 had 7 256 word ROMs whereas the HP-35 had just 3. Construction, batteries, and dimensions are the same as the HP-35. 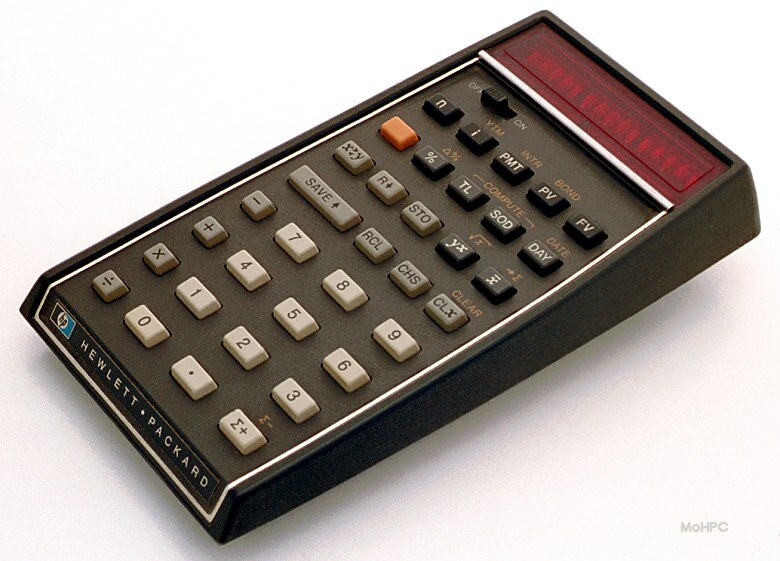 The HP-80 replaced the HP-35's x^y with y^x, relabeled the ENTER key SAVE and was HP's first pocket calculator to have a shift key. 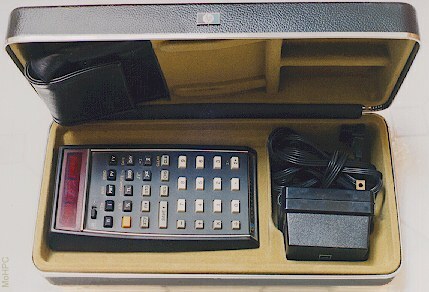 The HP-80 was more luxuriously packaged than its technical predecessor. The silver bar above the on/off switch was actually metal (in early versions) so it wouldn't wear off with use. 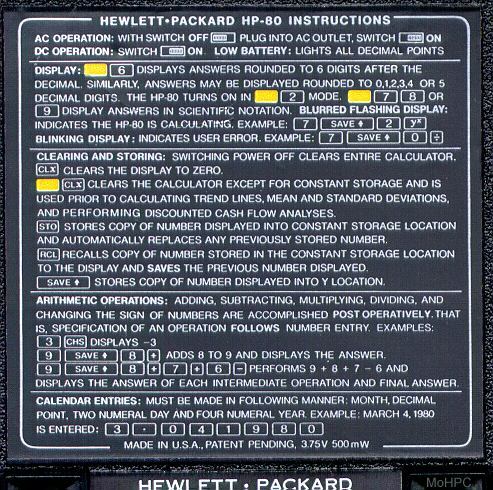 In place of the simple one piece molded plastic hard case, the HP-80 came with a metal case with leatherette covering on the outside and a fuzzy interior which held the calculator, leather case, quick reference guide and charger. 'When Charles Lamb wasn't writing literary classics, he labored as an accountant for the East India Company. During his dual career --1791 to 1825-- he often expressed a dim view of the business of business as it was when the standard calculating equipment consisted of a high stool, desk, quill pen, and a human brain--"I had perpetually a dread of some crisis to which I should be found unequal... I served over again all night in my sleep, and would awake with terrors of imaginary false entries, errors in my accounts, and the like..."